This thursday I received a nice surprise by post: two new roses from the rose nursery De Bierkreek. They are Hybrid Alba roses bred by the German rose breeder Rolf Sievers, one dark red named Crimson Blush and one white-pink named Morning Blush. Until today I had never heard of recent Hybrid Albas or of Rolf Sievers, but the information I have found on HMF makes me want to learn more about these new roses. I am very glad to now be the owner of these special roses and can’t wait to see the first blooms. I was searching for different climbing roses to replace the Bourbon roses Zéphirin Drouhin, which were growing against a rose arch. Now that I grow more old roses I have found out that Bourbon roses are not truly my favorite sort of roses (except maybe Souvenir de la Malmaison) and therefore I must make difficult choices and only keep the roses that I really like and also are very special or rare. 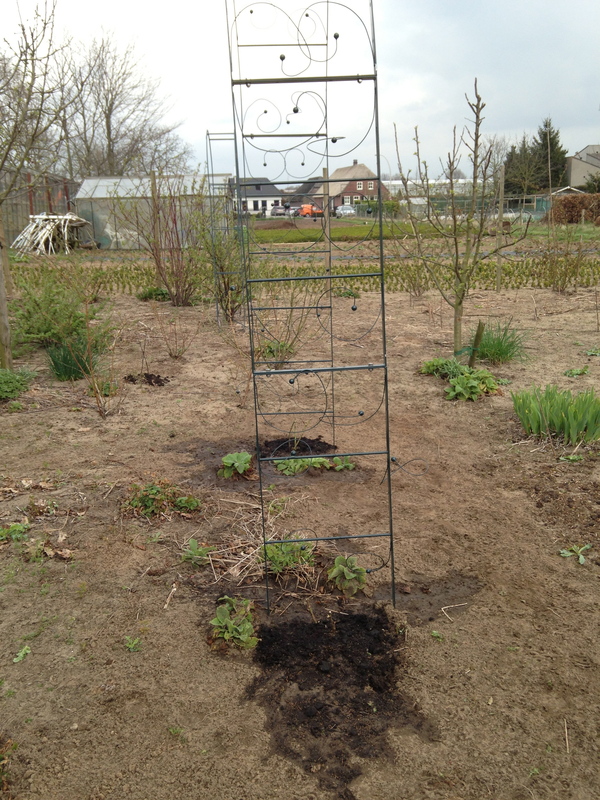 So yesterday I started to dig out the two old roses and plant the two new Alba roses. Easier said than done of course, but after one hour of hard work the two roses were out of the ground. One of the roses I have taken home with me to plant out in a different place. (It is always difficult to throw away a nice rose). Although the new Alba Roses are not exactly in the same place as the Bourbon roses, I’ve used lots of rootgrow just to be sure that the new roses have a good start. The rose arch is now again very bare, but hopefully the roses like their new place and grow energetic. Dit bericht werd geplaatst in News en getagged met Crimson Blush, Morning Blush op 20 april 2013 door Monique.